EasyWin games is a premium real time multiplayer games app, which is the first of its kind in Nigeria. It is a mobile application with highly-rated graphics that allows you convert airtime to bid coins, use this bid coins to bid against other game opponents, upon winning you double your bid coins and eventually accumulate surplus bid coins which can be converted or redeemed as airtimes. The app has a suite of innovative and interactive games namely Mission Ludo, Draughts Kings, Whot Bash, Bottle Smash and Quiz Scholar. 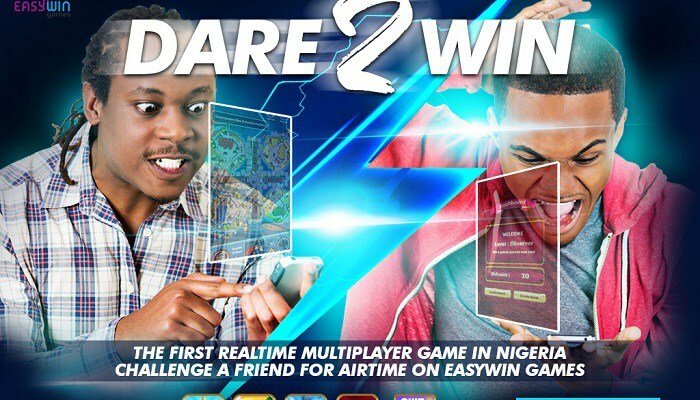 The easywin game is subscription based and can only be subscribed with an MTN line but can be accessed on any data bundle. All the EasyWin Games are accessible only on android phones from the Easywin Management app which can be downloadedhere. This is Ludo on steroids. A uniquely styled ludo with which you can catch all the feel of a navy war and rescue your men from some of the most deadly prisons of the world. It is a multiple player game where you get to customize the look and feel of your game board and use leaderboards to keep track of your opponents and their position. This is a highly upgraded version of the Whot you know. It has superb graphics, timed levels and can be played alone (single player) or with friends (multiplayer) on the go. On this game, you get to rule the world of draughts, win duels, socialise and win rewards during game plays. On Draughts Kings, you get to play games in real-time with other players online all over the country. Swipe and match your way through hundreds of fun levels in this bottle puzzle adventure. Bottle Smash is completely free to play for life after first initial subscription. You can play bottle smash on different games modes – Target Score, Timed Levels, Obstacles, Numbered Moves etc. How smart are you? You can find out on Quiz Scholar as you have fun challenging your friends and loved ones in insightful time based quizzes on any topic – entertainment, sports, riddle, bible, science etc. All the games can be accessed once you download the the app ateasywingames.com/app (Available only on Android Phones). You can convert your normal MTN airtime into Easywin game coins, and use these coins to bid against other game opponents. Upon winning you double your bid-coins and either convert your accumulated bid-coins to airtime or continue using it to play & win more. EasyWin gifts you 40 free bid-coins redeemable as airtime everytime you refer someone and he/she successfully subscribes, aside that bonus, you also get 20 free bid-coins redeemable as airtime on your first subscription. All coins are redeemable as Airtime to buy data, make calls or use as you wish. You can chat with your favorite listed friends and loved ones and invite them to a game play from within the app. You can even poke those offline to get their attention and start a game. Very note worthy is the fact that you can meet new friends on EasyWin Games. How? It has a random player feature that pairs you up to random people on the service to play games with. It gets cooler, as you play against friends – or random people as the case might be – whoever wins the game wins the coins staked and these coins are redeemable as airtime for data, calls or sms. On the app, you can register & subscribe at N10 daily or N50 weekly to get unlimited access to all the games. So hurry, Download the EasyWin mobile app at easywingames.com/app and get playing. Remember, Easywin is only available to only Android & MTN Users for now.